Care Ability is a leading North East family ran supplier and manufacturer of handling products for the health care . Working closely with health care professionals they ensure that their products are comfortable and easy to use. In the past we had developed an ecommerce website for Care Ability that allowed them to sell their products online. However due to the specialist nature of their products they soon found that visitors to the site were more interested in the information about the products and then would phone and speak to someone directly to place an order. Because of this they decided to change focus on the site to remove the ecommerce side and concentrate more an information driven site that would encourage more phone enquiries. 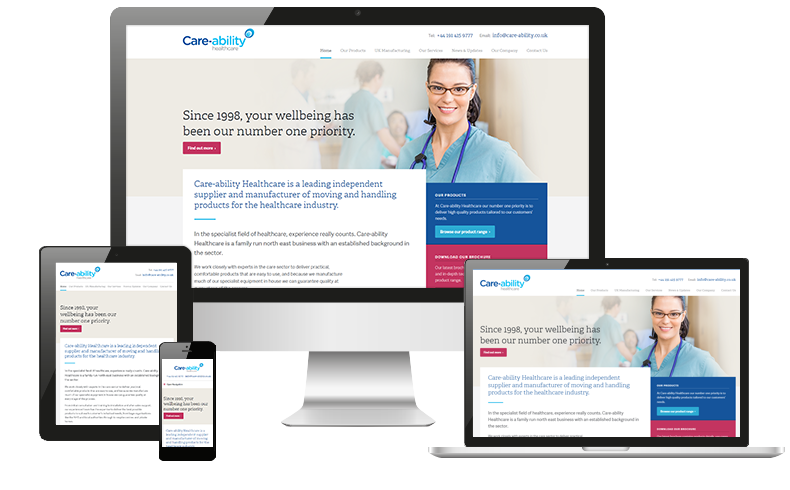 We worked closely with Care Ability to build a site that instantly lets people know what they do. As explaining their products and their core believes in as much detail as possible was important, we created the site to be fully flexible allowing them to add as many pages at they need. The site also has the added functionality that allows them to quickly and easily add videos and downloadable brochures.